Many illnesses can cause bloody phlegm, also known as sputum. According to Merck Manuals Online Medical Library, most of these causes are related to diseases and conditions of the respiratory system. Some of the illnesses that can cause bloody sputum are more benign than others. 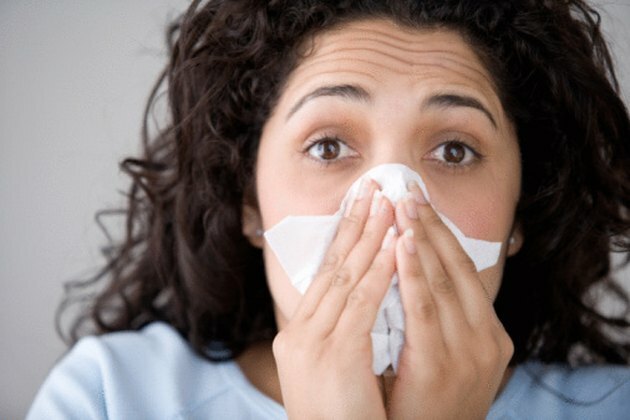 Blood-streaked respiratory secretions also can be expelled when blowing the nose. While blood in phlegm may be alarming, it is not a cause for major concern in many cases. The best course of action is to consult a physician. The Merck Manuals Online Medical Library lists bloody sputum as a possible, although rare, symptom of acute bronchitis. Acute bronchitis is an inflammation of the large airways that branch from the trachea. Acute bronchitis may be caused by a bacterial or viral infection and is usually associated with some degree of fever. The blood in the sputum may be due to small blood vessels injured by the inflammatory process. Acute bronchitis is frequently associated with upper respiratory tract or nasopharyngeal infection, which can also result in bloody mucus in the nasal cavity. MayoClinic.com describes tuberculosis as a possible cause for bloody mucus. Tuberculosis is a bacterial disease considered very resistant to antibiotics. It is, therefore, treated by long durations of aggressive combinations of antibiotics specifically developed to destroy the causative organism. Infection with the bacteria causing tuberculosis, called mycobacterium tuberculosis, might not necessarily cause an individual to be diseased: it depends on her immune response. Individuals with defective immune systems, such as patients with acquired immunodeficiency syndrome, are at a greater risk of falling seriously ill with tuberculosis. Symptoms of tuberculosis include night fevers, night sweats, weakness, malaise and weight loss. Pulmonary embolism is perhaps among the most dangerous causes of blood in phlegm. According to MayoClinic.com, pulmonary embolism develops when a blood clot formed elsewhere in the body, usually in the lower limbs, travels in the blood and then lodges in one of the arteries of the lungs. Pulmonary embolism usually manifests in sudden, severe, shortness of breath that is not relieved by rest and is associated with chest pain. Pulmonary embolism may also present with a cough that brings up blood-tinged sputum. Pulmonary embolism can be fatal if not managed properly. What Are the Causes of Infiltration of Lungs?